Lok Sabha Speaker Sumitra Mahajan inaugurated the centenary celebrations of the 19th Kushok Bakula, Lobzang Thupten Chognor at Mavlankar Hall, Constitution Club in New Delhi on 23 November. 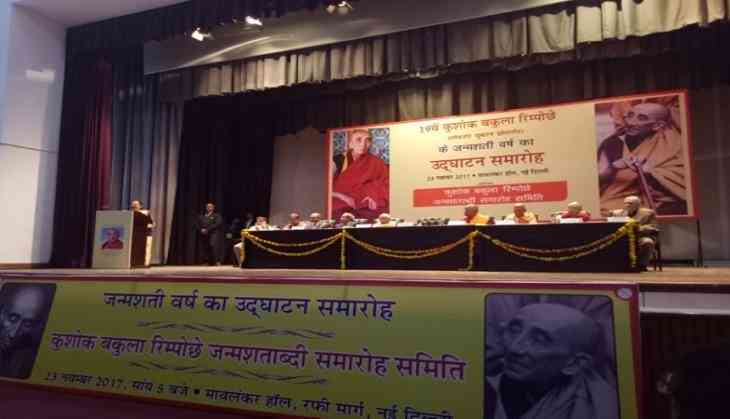 Suresh Soni, General Secretary of the Rashtriya Swayamsevak Sangh (RSS), was the chief guest at the function. Acclaimed as a statesman and diplomat, and popularly known as the architect of modern Ladakh, Kushok Bakula was awarded the Padma Bhushan in 1988. He has been recognised by the 13th Dalai Lama as a direct disciple of Gautam Buddha. While paying tributes to Kushok Bakula as a great parliamentarian and for his contributions in all fields of life, Sumitra Mahajan reflected that good persons need to be introduced to the people. Elaborating on the commitment of Kushok Bakula towards the nation, she remembered that when he visited Lhasa (Tibet) as representative of the Government of India, he reported back to then Prime Minister Jawaharlal Nehru about the dangerous situation emerging vis-a-vis Chinese activities. His observations later turned out to be true. The Lok Sabha Speaker congratulated the organisers of the centenary celebrations for embarking on such a mission. Speaking on the occasion, Suresh Soni said Kushok Bakula was a great personality, but few people know about him. "Great personalities should not be seen in the context of their place of birth. They belong to the entire nation and should be recognised as such. He was a Buddhist monk. Monks are peace-loving ascetics. But when Pakistan tried to invade the territory of Ladakh, he took it upon himself to motivate the youth to repulse the invasion." Kushok Bakula was a member of the Constituent Assembly of Jammu and Kashmir, which also functioned as the first State Assembly under the leadership of Sheikh Abdullah. However, he never shied away from raising his voice for the rights of the people of Ladakh, even at the cost of angering Sheikh Abdullah. Later, he went to become Member Parliament (MP) and retained his seat for 10 years. Kushok Bakula was later appointed as Ambassador to Mongolia. His stayed in Mongolia for almost a decade. He became so involved with the people there that even today the people of Mongolia remember him for his immense contributions. The Kushok Bakula centenary celebrations are proposed to be organised across India for a year jointly by Jammu Kashmir Study Centre (JKSC) and Himalayan Sanskriti Sanrakshan Sabha. Shashank, a career diplomat of the Indian Foreign Service who retired as Foreign Secretary will preside over the organising committee of the centenary celebrations. JKSC is an independent think-tank dedicated to research and policy relevant studies on all aspects relating to the state of Jammu and Kashmir. It has been the endeavor of JKSC to bring to the fore the rich cultural diversity of all regions of Jammu and Kashmir state. JKSC director Ashutosh Bhatnagar said Kushok Bakula's contributions to the nation were so great that the people deserve to know about him. READ NEXT >> After Mugabe, all eyes are on Museveni: how long can he cling to power?